As you know, I joined the team at the New York Cork Report about a month ago. Part of the reason I was brought on was to help the Cork Report cover more of Long Island. To bring you the stories you may not have know about or an interesting view into an event. Another reason I joined the NYRC was to help out with organization of events the Cork Report was working on or planning. This was the one aspect of the job i was looking forward to. No sooner that I came on board I rolled up my sleeves and began working on a wine dinner with one of the Niagara Escarpment premier wineries, Arrowhead Spring Winery in Lockport, NY. Run by the husband and wife team of Robin Ross, who runs the vineyard and Duncan Ross who is the winemaker, year in and year out the produce some of the more interesting and delicious wines from the Niagara Escarpment. When Lenn Thompson, editor and publisher of the NYCR, Lia Fallon, executive chef at the Riverhead Project and I sat down to taste the Arrowhead Spring wines and brainstorm a menu, it kinda came together quickly and it was hard to leave a wine out of the mix. With that being said, I think that Lia has come up with a spectacular dinner and one that with entice the taste buds and satisfy your palate and hunger. In fact, it may want you to beg for seconds. The real thrill of the evening will not only be the menu, which is below, but the fact that Robin and Duncan will be on had to talk about the wines and answer any questions you may have. 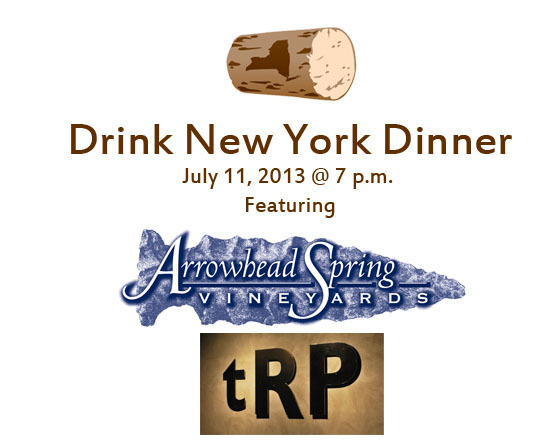 Reservations must be made with tRP by calling 631-284-9300 and letting them know you want a seat at the New York Cork Report Dinner on July 11th with Arrowhead Spring Winery. If you made earlier reservation at another restaurant, please cancel them and make your reservation with the Riverhead Project. Really sorry for that inconvenience. So until then, I can tease you with this menu. You really don’t want to miss out on this dinner. Go make reservation now, if you have not done so already at the Riverhead Project. Seriously — Pinot Noir and Syrah from NYS along with a Raw Bar, Frogs Legs Pork Belly and Lamb Loin — how can you say no. This entry was posted in Long Island, New York Cork Report, Winery Dinner and tagged Long Island, New York, Niagara Escarpment. Bookmark the permalink.